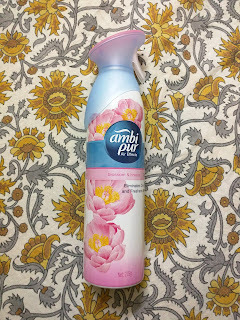 Jill Of All Trades: Springtime freshness this monsoon thanks to Ambi Pur Air Effects! Springtime freshness this monsoon thanks to Ambi Pur Air Effects! Today, something fresh and delightful came in my mail. 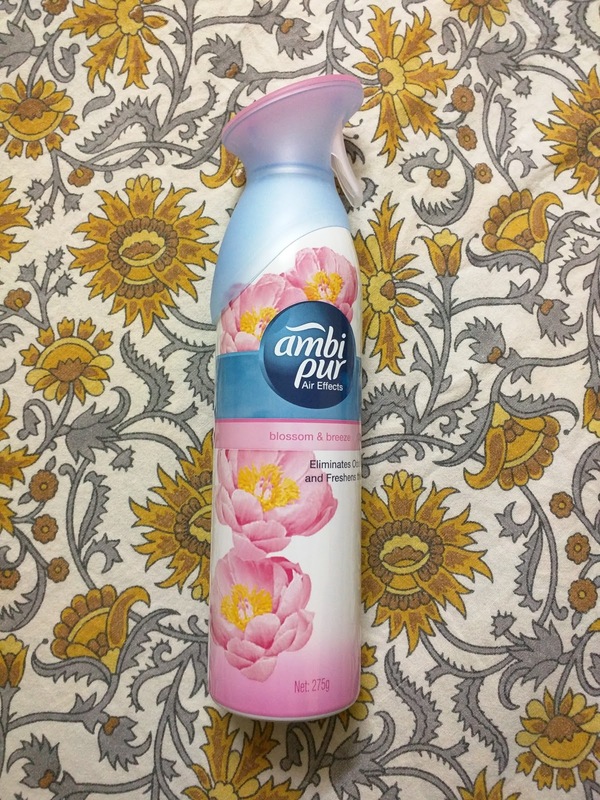 No, not a bouquet of flowers, but something even better and long-lasting - the all new Ambi Pur Air Effects - Blossoms & Breeze. If you haven't already, do read my blog on the 'smelly' issues of my day to day life. To counter and get rid of that, the Blogadda team was very kind to send across a Air Freshener! The first thing that caught my eye was the packaging. In its hues of pink, blue and purple; this product looks as lovely as it smells, and will not look weird or out of place when you keep it anywhere. It has a easy to spray trigger, just hold and press in a sweeping motion! 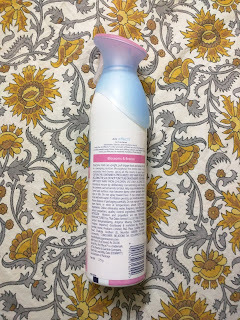 I remember the earlier sprays being the cap ones in which I used to most often loose the caps, sometimes the trigger used to be so hard that I used to have to use two hands to spray the air freshener (Yes, true story). Coming to the smell, it has a very sweet, refreshing spring smell that makes me feel like I'm walking in the garden among freshly bloomed flowers! No wonder this particular fragrance is called Blossoms & Breeze. In an instance the entire room's odors are vanished and there is this instant positive energy spread! I'm sure Vastu or Feng Shui do mention keeping your home away from bad odors! I was in an instant good mood even though the rains have made everything so gloomy and dull. 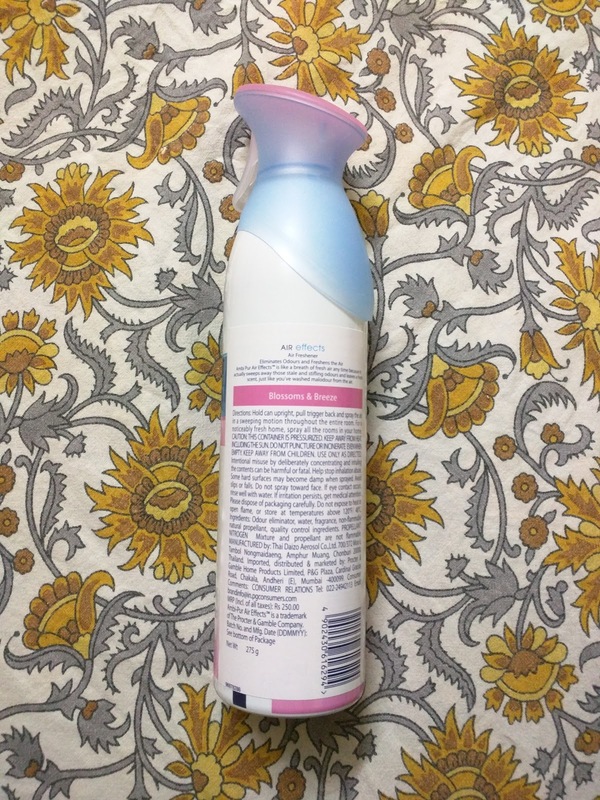 So all the kitchen odors, my baby peeing & pooping everywhere, the musty leakage smell thanks to the rains can now be single handedly combated with this new weapon aka Ambi Pur Air Effects! Also available in other fragrances like Citrus, Lavender and Vanilla which I am totally buying one after the other every time it gets over. They are priced at Rs.250 and easily available to purchase online from all leading eCommerce portals.